Set in the perfect location. On a residential chalet estate with plentiful trees, it is a very pleasant place to spend Spring or Autumn because of the mild climate. The local beach can be enjoyed throughout the year. Restaurants with Mediterranean food at good prices. Fully equipped kitchen, with a washing-machine, combi fridge-freezer, toaster, electric kettle, juicer, coffee-machine, microwave, vacuum cleaner and all the necessary utensils. The porch has been enclosed and is a nice spot to enjoy the local greenery. The top floor has a large solarium for sun-bathing or having a barbecue.Near to places of cultural interest, such as Orihuela, the mud spa in Lopag�n, the Palmeral and the El Huerto del Cura gardens in Elche, the seafront promenade in Pilar de la Horadada and its spectacular sandy beaches, the cities of Murcia and Cartagena, as well as Torrevieja and its Habaneras shopping centre where you can find well-known shop chains like Springfield, Zara, H&M, C&A, etc. Shopping centres and restaurants with music within the estate itself. Torrevieja is 15km away, with all kinds of shops, cinemas showing films in English and a hospital. There is another hospital in Orihuela. Very peaceful. Looked after. WIFI area availaible nearby. Alicante (70 km), Elche (60 km), Cartagena (49 km), Murcia (60 km), Torrevieja (10 Km), Mar Menor (40 Km). Ideal for playing golf throughout the year. Sunbathing is also possible at any time of the year on the amazing nearby beaches due to the amount of sunshine hours this area receives per year. 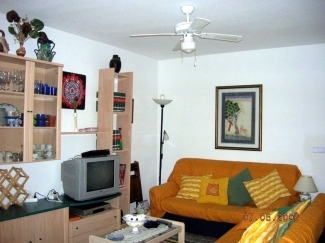 The estate is very large and walks through the tree-lined streets are very enjoyable. 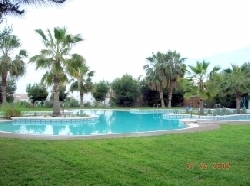 Superb communal swimming pool, with green areas and pretty places for taking walks next to the sea or through the gardens. Please contact the owner regarding prices, especially during the summer. Available for long-term rent. Special rates for Easter and Bank-Holidays. Ideal for playing golf, walking and sunbathing on the beaches.